The greatest card show in San Antonio is Friday the 25th through Sunday. Sports Cards Plus, a.k.a. The Super Hit Factory is taking a sample of the LARGEST inventory in Texas to the show. GREAT NEWS: You don't have to wait until Friday to get our LOWEST PRICES EVER! SALE starts Monday, the 21st! We had a nine box allotment of 2013-14 UD Black Basketball. Our boxes included a Michael Jordan Auto Arena Book 23/23, a Michael Jordan Auto #d/25 and Josh's redemption for a Lebron James Auto CD #d/25. The odds of getting a Michael Jordan Auto or Lebron Auto are 1:6. So come to Sports Cards plus and beat the odds. Adam came in to try a box of 2014 Topps Gypsy Queen Baseball. 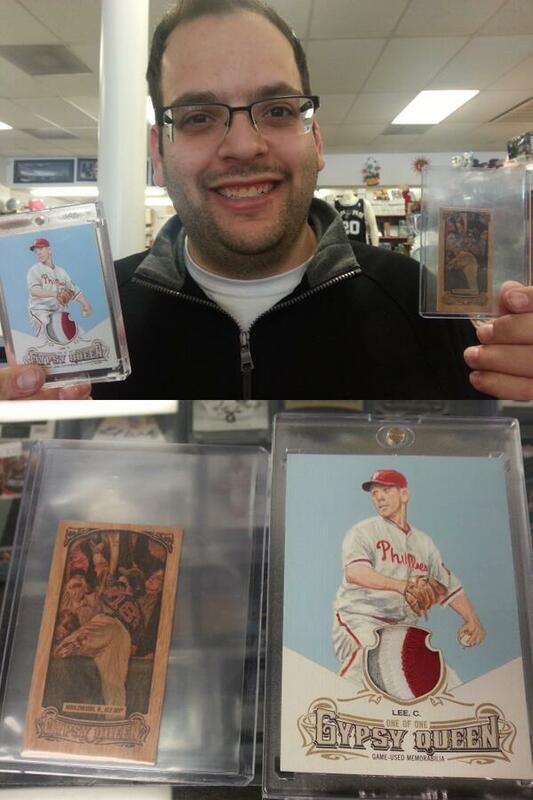 Here's Adam with his Cliff Lee Original Art 3 Color Patch card 1/1 and Will Middlebrooks Wood Card #d/10. One good pull deserves another. Scott came in twice. First time in Scott pulled this 2013 Topps Supreme Dez Bryant Autographed Jersey Letter 1/1. A few days later Scott pulled this 2014 Press Pass Game Day Teddy Bridgewater Auto #d/5. 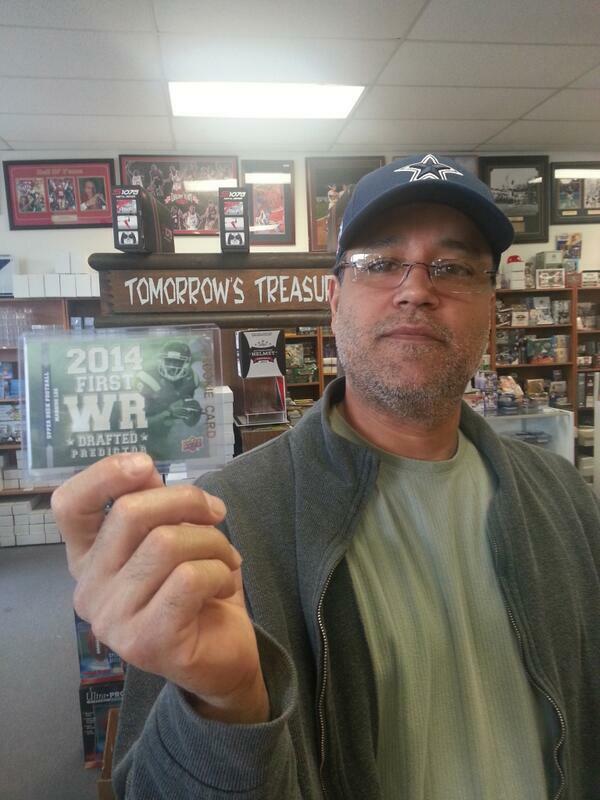 Jay came in for the arrival of 2014 Upper Deck Football and enter our Johnny Manziel Best Pull $100.00 Contest. Jay didn't come up with a Manziel Auto but he did pull a sweet Blake Brotles Auto RC and a Drew Brees Auto. Anthony gave it a try but no Manziel Auto but he did pull this rare Marquis Lee First Wide Received Drafted Predictor card. Predictor cards are 1:440 packs! 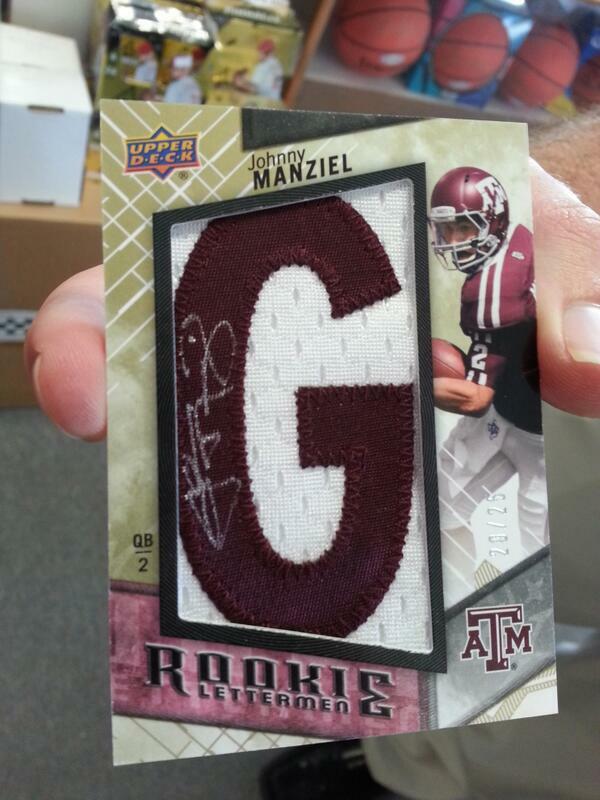 Well, we finally got a Manziel Auto. Josh pulled this Johnny Manziel Auto Letter #d/25. Josh is the winner of our $100 Best Pull Contest. We sold out our allotment of 36 boxes of 2014 Upper Deck Football in just over one day. Did you miss out? Don't worry, 24 MORE BOXES of 2014 Upper Deck are due in TUESDAY! Come on in and have some fun! 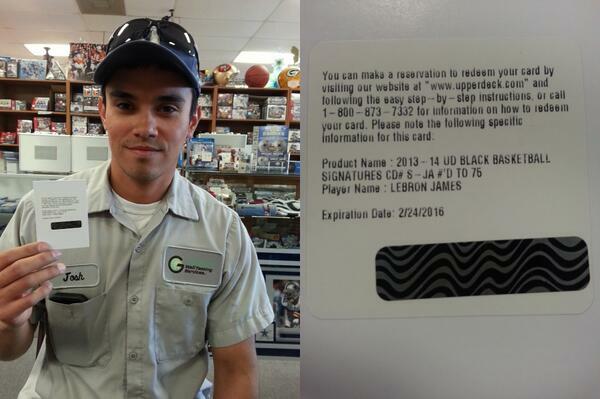 Jose came in to try a box of 2013-14 Panini Titanium Basketball. 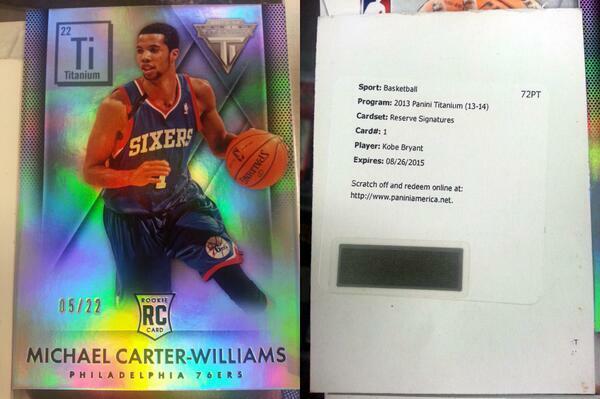 Jose's box had this Michael Carter-Williams RC Parallel #d/22 and a redemption for a Kobe Bryant Auto! Nate came in to try out his luck at The Super Hit Factory. First he tried a box of 2014 Leaf Originals and pulled this Jadeveon Clowney Auto Paralled #d/99. 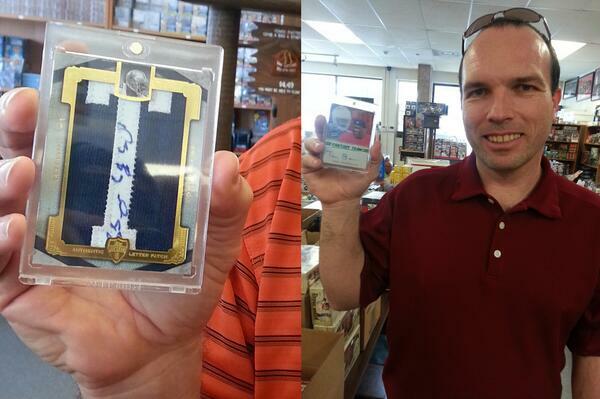 Next, Nate wanted to try to pull the winning ticket for a FREE 2012-13 National Treasures Slot in our FREE GROUP BREAK. Nate had already won one FREE SLOT but he wanted another. So Nate opened our LAST BOX of 2012-13 Intrigue Basketball. Nate pulled this Damion Lillard Auto Patch RC #d/49 and pulled our last WINNING FREE SLOT. Since all the slots were filled and we had two Free Slot Winners (Nate and Jose), we broke the 2012-13 National Treasures Basketball Box. Nate won this Iman Shumpert Auto Jumbo Patch RC #d/99 and Kyrie Irving & Bradley Beal Dual Auto #d/49. So, do like Josh, Adam, Scott, Jay, Anthony, Josh, Jose, and Nate. Don't be the guy who says, "That could have been my picture." Come to Sports Cards Plus this week for our LOWEST PRICE EVER SALE. Pick your box from THE BEST CASES in The Hobby. Pull your Super Hit. Enter our contests for $700.00 and have some fun. Don't be the guy who says, "That could have be my picture."